The Rainbow Fountain is used to paint a pet a colour of your choice. Because this is an extremely popular service, only those who complete a quest for Naia the Fountain Faerie may use it. Have you ever wondered what it looks like to get a Fountain quest? Want to know what happens when you do get one? Hopefully, this walkthrough can answer your questions. Note: Using the Fountain's magic on an unconverted pet will convert it to the new art style (the one that can wear clothes). 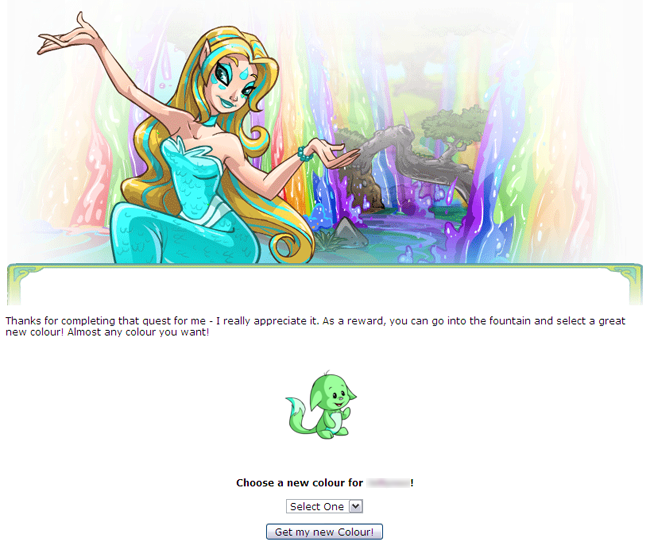 Getting a Fountain Faerie quest (commonly abbreviated to FFQ) is a very rare event that happens while browsing the Neopets site. It comes in the form of a regular faerie quest, so if you didn't complete your last quest, or if you canceled/abandoned one recently, you need to visit this page. There is also the chance that you may be awarded a trip to the Rainbow Fountain after completing a Grey Faerie quest. Now, in order to receive entry to the Rainbow Fountain, you have to get the item the faerie wants. The item can be any r94-96 item, which can be unbuyable... or buyable if you're lucky. If you're having second thoughts about going to buy an unbuyable item, think about this: Is the colour you want from the fountain worth more than the item? If so, then you're saving a lot of money! For example, I once paid 100,000 NP for the Shoyru Blue Aviator Shirt while a Pirate Paint Brush was then worth several million Neopoints. Prices fluctuate all the time, though, so make sure to do your research! 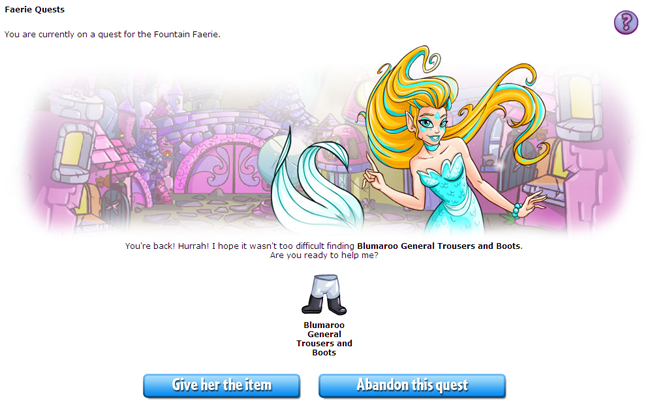 There is no time limit on the Fountain Faerie's quests, which is just as well since it might take you a while to get together the Neopoints necessary to buy the item she has requested. She will sit quietly and wait for you to return, although you won't be able to use the Shop Wizard while you have a quest outstanding. Purchase the item, then go to the quests page to hand it in. It is also worth mentioning that you have to have at least one Neopet on your account before you turn in the item. This probably won't be an issue for most of you, but you should bear this in mind if you receive a quest on a side account where you don't hold any pets. If you don't have any Neopets and you complete a quest, you will not be given the opportunity to create a pet to paint, Naia will simply thank you for the item and then leave without granting you access to the Fountain. From February 7 to February 24, 2011, Faerieland was in need of supplies, so faerie quests were offered daily to anyone who visited the quests page. Fountain quests were given out during this time, but it was still randomised so only lucky users got them, and the Fountain Faerie still asked for rare items. Once you have Fountain access, you can take your time--you won't get kicked out for being indecisive. You can go about your business on the site safe in the knowledge that you can return to the Fountain whenever you choose. However, once you successfully finish the painting process, your access ends, and you'll have to wait for another Fountain quest in order to start this whole cycle again. You may have only one Fountain access pass at a time! If you have completed a Fountain quest and don't use it right away, you'll probably want to use it before turning in another Fountain quest item (should you be lucky enough to receive another one). You unfortunately cannot "reserve" access from having multiple Fountain quests. You can, however keep your second quest incomplete for as long as you like, so long as you don't mind forfeiting the use of the Shop Wizard. When you would like to paint your pet, set it as your active pet in Quick Ref, and visit the Rainbow Fountain to choose the colour. Not sure which colour/species combination to choose? Check out our Rainbow Pool to view all the possible combinations. But be warned... not all colours show up as options at the Fountain! Congratulations! By now your pet should have obtained a spiffy new paint job! As a note, your pet's clothing will be removed upon a successful dip. 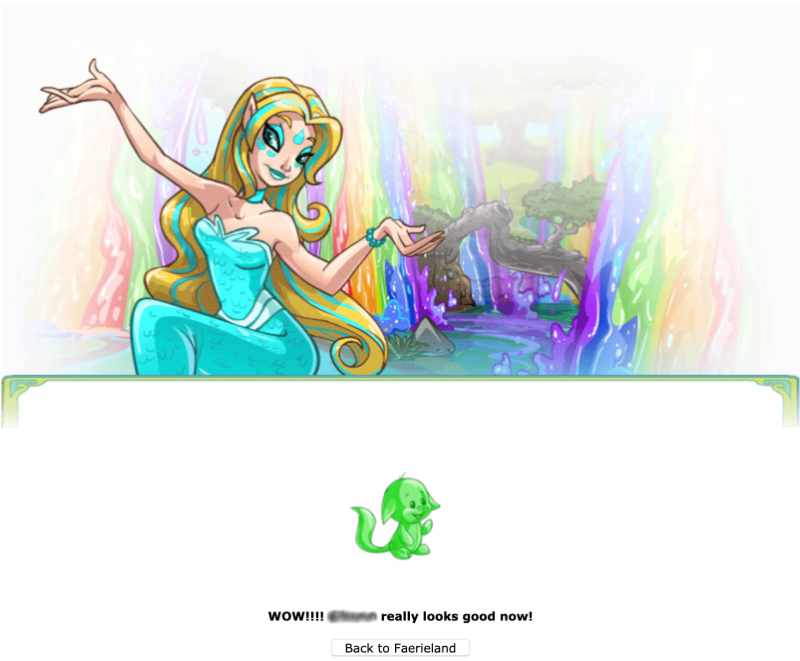 You may also not see the new version of your Neopet if the old image is being cached by your computer, but in most cases you'll see the results on the success page above. Complete a quest for the Fountain Faerie and paint your Buzz any color at the Rainbow Fountain.